Mrs. Parker at work Monday. Barbara Parker has been busy the last four years. Teaching in Rutherford County and serving the state as a No Child Left Behind consultant has prepared her to lead Cannon County's school system again at a time when new curriculum and standards are being established. "The bar has been raised," she says. 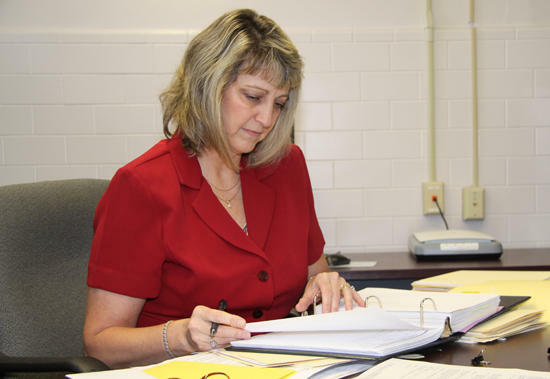 "I've worked with a lot of systems on the high priority list and it's my goal to keep Cannon County off that list." While she enjoyed the traveling that her last positions demanded, Parker is glad to be home. "There are a lot of new faces, I look forward to meeting everyone." Teacher in-service is this week and school begins in full swing next week.